It was a day of highlights and lowlights for Leg 1 of the Australasian Safari. Sand traps, tricky twisting navigation and rugged terrain in three stages in and around Northampton and Kalbarri in Western Australia. 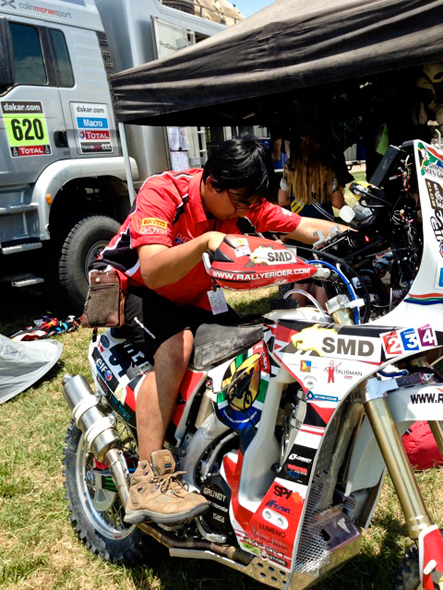 Last year’s moto winner Jake Smith had his plans for a follow-up Safari victory shattered in the last portion of Leg 1. After winning both the first and second stages by nearly a minute, engine failure in the last stage forced him to stop. Brother and former Safari winner Todd Smith finished the Leg in second place, and said despite a slow start he had finished well. 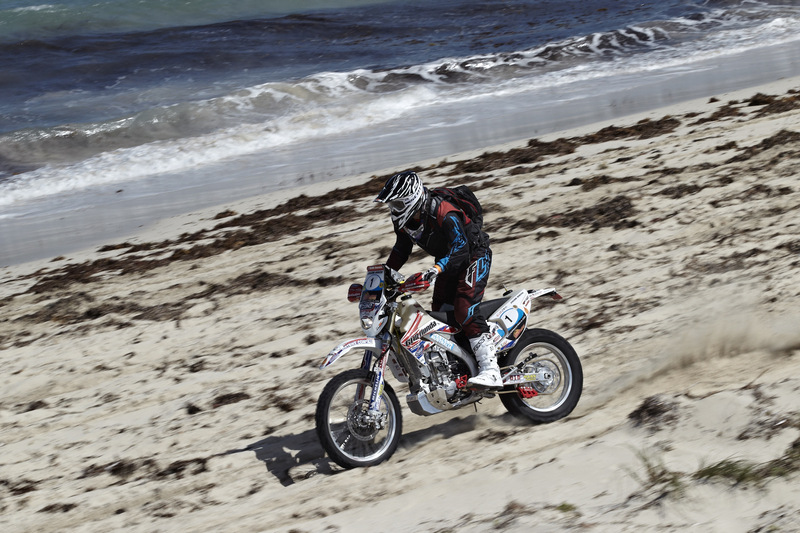 “The first stage was really sandy and soft and the front wheel sunk. I came off and it took me a little while to get my flow back. Later on I had to slow down for some sheep but the rest of the ride was smooth.” He starts 455 km of Leg 2 second on the road. 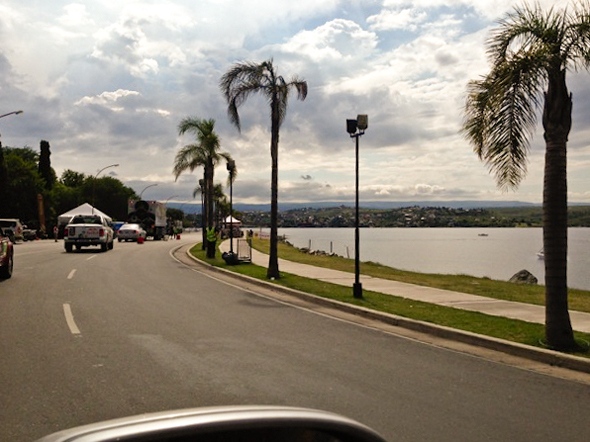 Leg 2 promises to be another testing day for the moto field. Three selectives cover a wide variety of terrain, with tight sections interspersed between flat-out fence line dashes. SS2/1 Kalbarri – 230.00km: Opens with 50km of defined coastal tracks over mixed terrain, heading north through Murchison Station before turning inland. Fence line tracks cut into low scrub pass through Nerrin Nerrin and Coburn Stations. 25 km of the “Snake Road” leads to the Hamelin Service Area. SS2/2 Gladstone – 110.89km: Low lying bay country between Hamelin Pool and the North West Coastal Highway hosts SS2/2. Highly variable tracks – sandy in places, rough and rocky elsewhere and occasionally swampy – cross Hamelin, Carbla, Yaringa and Wooramel Stations. SS2/3 Jimba Jimba – 113.77km: The last selective starts on Pimbee Station with a narrow tight rally road heading east towards the old Pimbee Homestead site. The course then turns northwards along a twisty rally road, deviates east briefly and turns north once more into dune country. The stage closes with a mixed bag of tight twisty tracks, narrow fence tracks and low creek country. 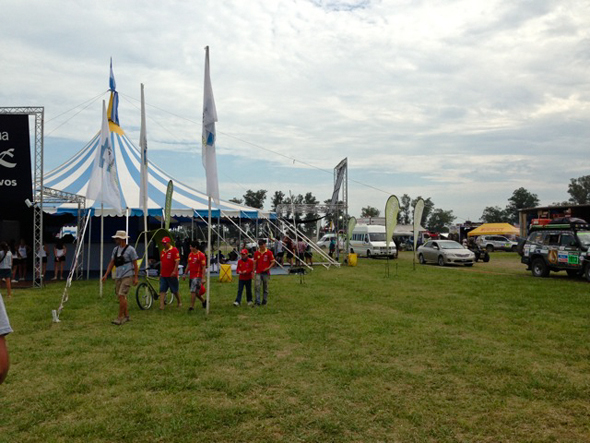 The 2013 Australasian Safari is now underway! The Jurien Bay prologue held yesterday was a short 7km sprint through gravel rally roads leading into winding, sandy coastal tracks and a dash along the water’s edge. 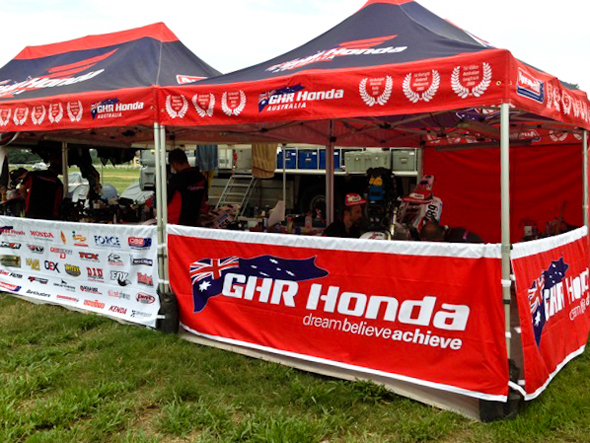 While barely 6 minutes into the 3200km event, GHR Honda team mates Todd and Jacob Smith have secured second and third in the start order for the 270km of racing on Day 1 between Northampton and Kalbarri. Last year’s moto winner Jake Smith said it was all good for him out there today. “I’m looking forward to this week, I’m aiming to win, I don’t come to Safari to come second,” he said. Day 1 opens with more coastal terrain on SS1/1 Oakabella routed through 23.26km of mixed sand and rocks. Straight away, competitors have been promised challenging navigation. SS1/2 Whelarra returns to a stage run in the 2012 event. 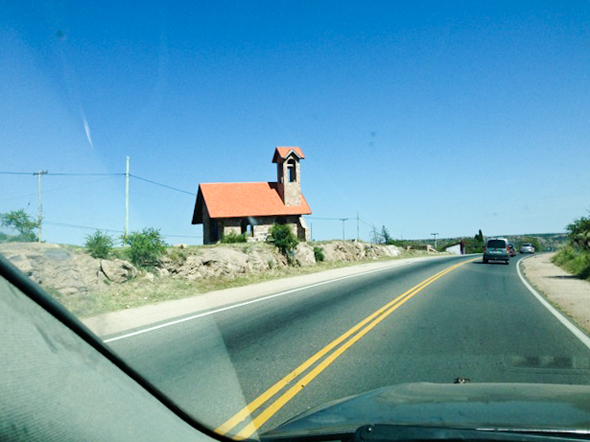 It is a fast, open selective of 104.85km through farm country. Firmer tracks will allow the riders to hit their straps as speeds increase. The final selective stage SS1/3 Murchison Off Road Yandi starts where 2012 finished. The 142.82km of rugged terrain are loaded with cautions amongst the rough tracks of Yandi, Coolcalalaya and Mary Springs Stations. Having crossed the Murchison River, the competitors head to the one night bivouac in beautiful Kalbarri, 592 north of Perth. The Australasian Safari is an annual off-road rally for motorbikes, four-wheel drives, side by sides, and quad bikes set in outback Western Australia. This extreme motorsport event attracts some of the best competitors from around the globe. Considered Australia’s answer to Dakar, it is renowned as one of the toughest and most challenging motorsport events in the world. GHR Honda riders Jacob and Todd Smith will be riding their CRF450X’s again chasing the outright victory. The Honda brothers went 1st and 2nd Outright at the Condo 750 rally and then backed it up with 1st and 2nd Outright on their CRF450R’s at Finke. For this cross country rally they are back on their CRF450X’s and hope to replicate previous Safari results of 1st and 2nd outright. Today is the ceremonial start and Friday will see the riders attack Prologue. The ceremonial start and Safari show will be held at Wanneroo show grounds from 4-9pm. Competitors will depart from Perth and head north to Geraldton, up into the Gascoyne region, around the Kennedy Ranges before heading out to tropical Carnarvon. Turning south again the course moves through Kalbarri before finishing in Geraldton on the 27th of September. The event covers approximately 3000km of Western Australian terrain. After the rave reviews and success of 2012’s course, this year’s Safari will again feature some spectacular coastal Stages along WA’s Coral Coast. The team recently held a test session on the east coast before all the infrastructure was shipped across to Perth. 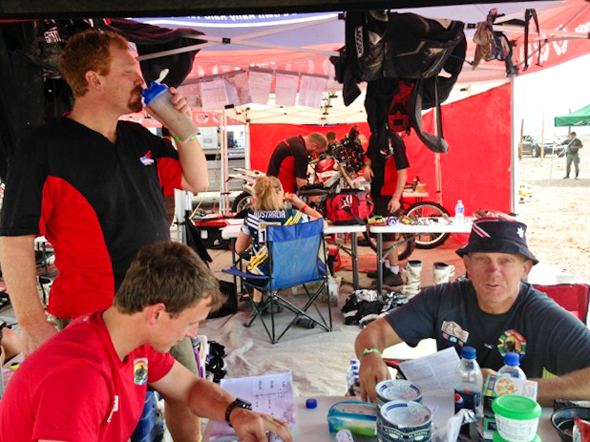 Team manager Glenn Hoffmann commented, “Testing went well and Simon has again done a great job with the bikes. The boys are very happy with their Honda 450X’s and now that they are passed scrutineering it is just a waiting game to get the race really started.” When asked who he thought would win he added, “Yamaha and KTM have strong rider line-ups and there is even a Aprilla this year. However Jacob and Todd have been swapping Outright wins in the desert all year long on both their GHR Honda 450R’s and 450X’s – so hopefully it is one of the boys. The Safari is a very cruel race to man and machine and I think the person who is best prepared and has the least downtime will do well. As a race Dad you cant play favourites, but obviously I hope the winner is on a Honda and surname is Smith!”. 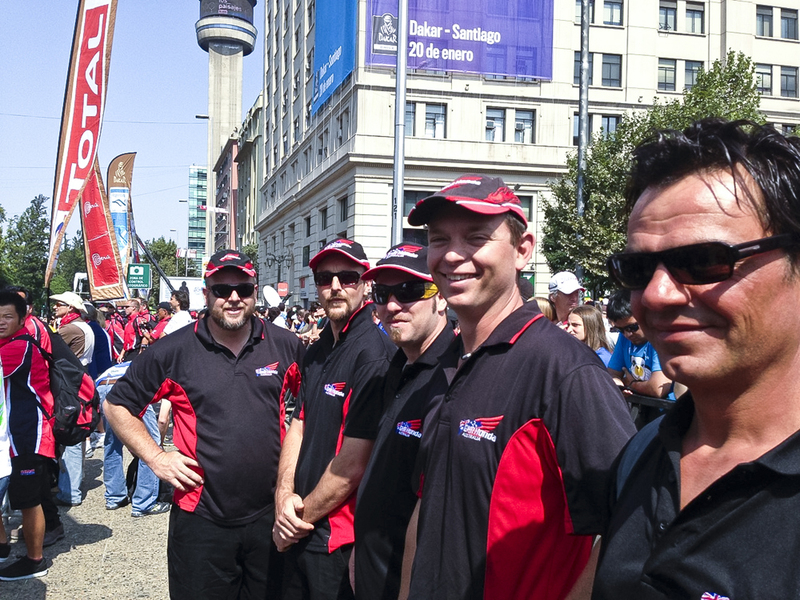 The boys will once again be joined by WA Honda riders Charlie Ball and John McDonald. 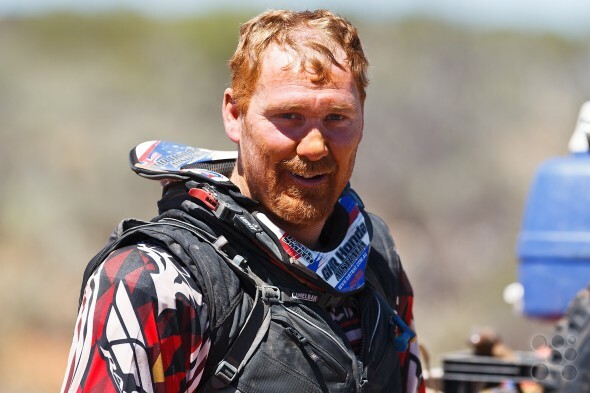 Two years ago Charlie rode with GHR to a top ten finish and after taking a supported ride at Finke this year, John McDonald is ready to tackle the Safari challenge. Keep up to date with their progress via GHR. 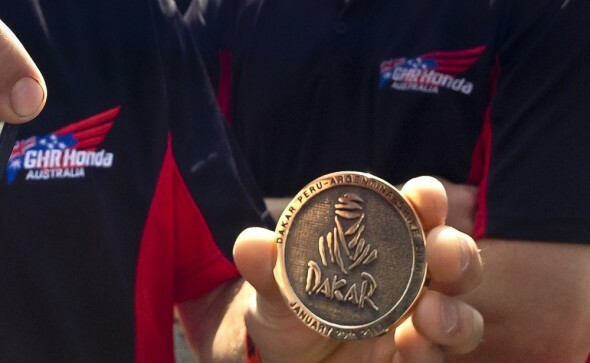 For Honda the Safari is another historic desert race. With more wins at the Safari than all other manufacturers combined, Honda is once again aiming to prove the reliability and performance reputation it has earned over decades in the desert. Having been aligned with GHR for the last ten years on Safari, the manufacturer backed team has only lost the rally once and has even beaten five time Dakar winner Cyril Depress on his works machine. The team would like to thank all the staff, sponsors, family and friends of GHR, for without their help this effort would not be possible. It is a monumental effort to get to the start line but to keep winning year after year in this rally environment – at times against the worlds best – is a credit to everyone involved. Good luck and a safe trip to all on Safari. 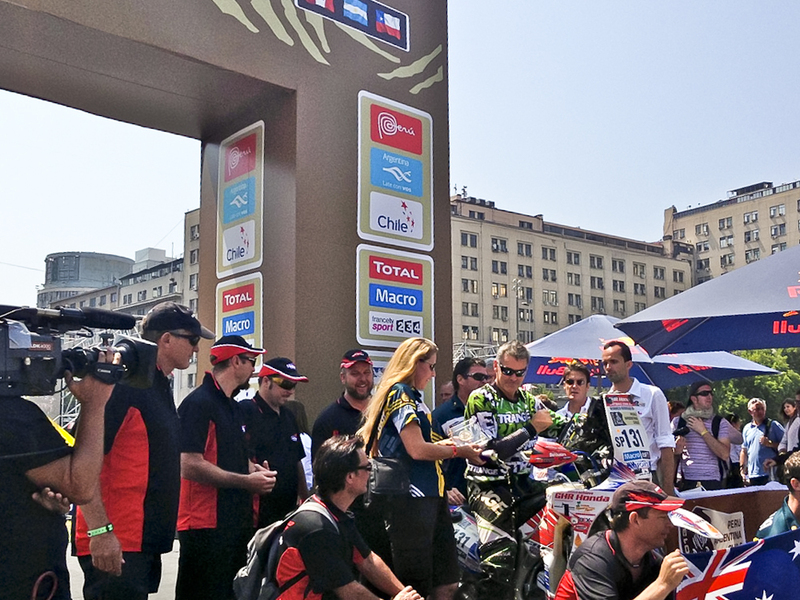 The Dakar Rally returned to Chile this morning. After a painfully early departure from Fiambalá the field trekked 392km through the lofty Andes liaison to cross the border once more. Today’s special was 319km in length – an exhausting task after their second exposure to extreme altitude in the last week. Only 130 motorcycle riders approached the start line today, roughly two thirds of those who started in Lima – and the attrition rate is much the same in the quad class. Now that the rally’s end is in sight, GHR’s strategy is geared towards securing a finish for the four riders rather than risking everything with last minute heroics. 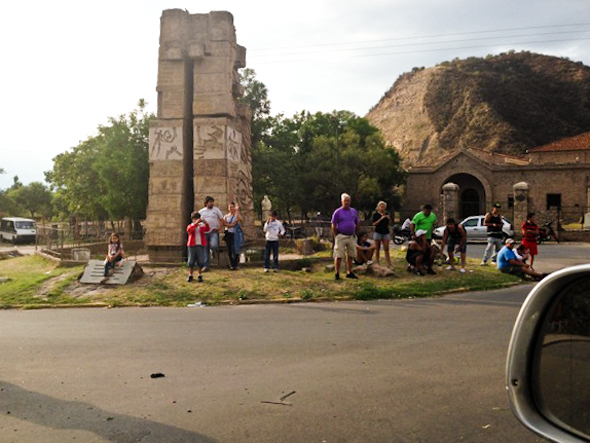 All four team riders are now resting up in the Copiapó bivouac in preparation for tomorrow’s long stage. #89 Brett Cummings managed to climb the order from his 54th start position to finish in 35th place. In doing so he’s continued the upward trend in the general standings, now occupying 50th position. #156 Todd Smith has also capped off four days of improvement with his finish in 21st place today, bringing him to 34th overall. #131 Warren Strange is best placed of the GHR riders, holding 28th overall. I had a good day today! Made no mistakes and I’m doing better with the nav in the dunes. I’m just focusing on getting the bike to the finish now… can’t believe we are so close to the end, 2 stages to go… up to 34th overall now. #274 quad rider Paul Smith had this run thwarted today by a flat rear tyre, forcing him to back off for about 100km of the special. It didn’t slow him sufficiently to prevent him advancing in the overall standings where he’s now placed 7th. The penultimate stage in Dakar this year, Stage 13: Copiapó > La Serena, descends back to the Pacific coast via a 90km liaison. 441km of mixed soil, sand and dunes await in the special and the last bivouac site lies in La Serena at the end of a further 204km transport. The rally still has well over 1,300km to run. 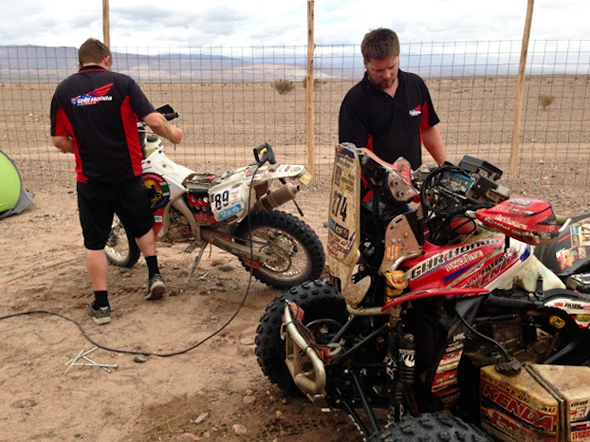 Dakar 2013: The "rest day" was not so for mechanics Rob and Simon. Dakar 2013: Jake Young - this is a rest day? 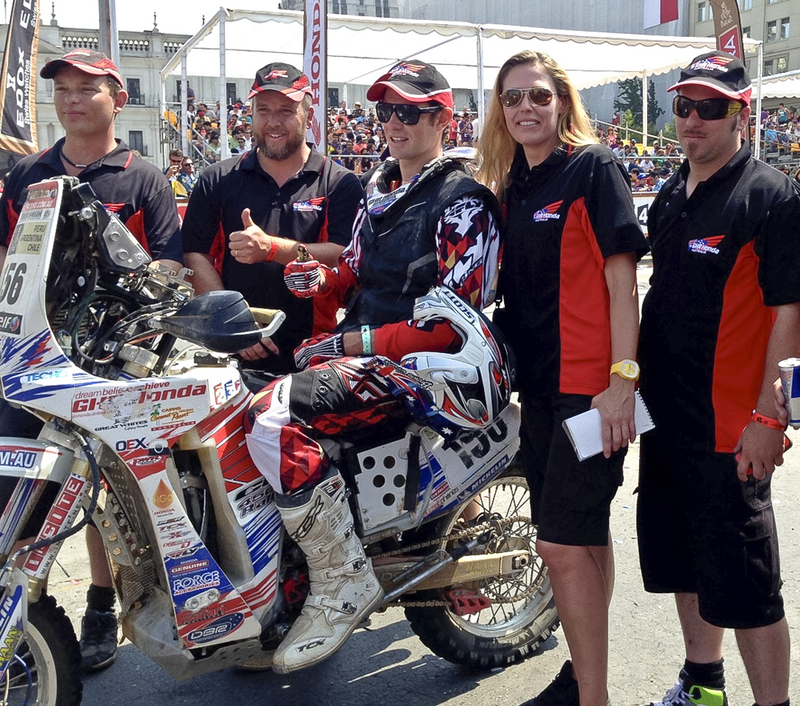 Dakar 2013: HRC engineers checking out the GHR Honda. 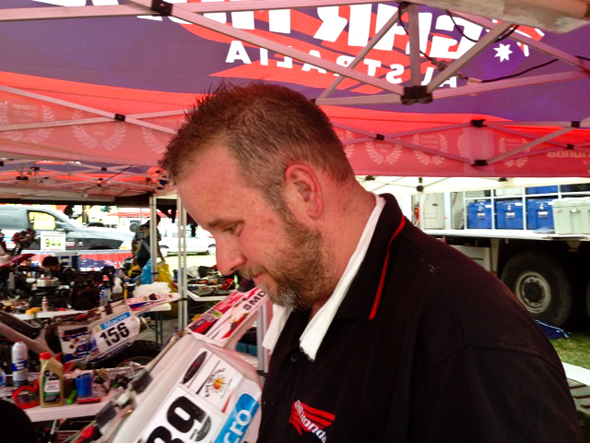 Dakar 2013: One of the HRC engineers trying the Australian flavoured 450X. 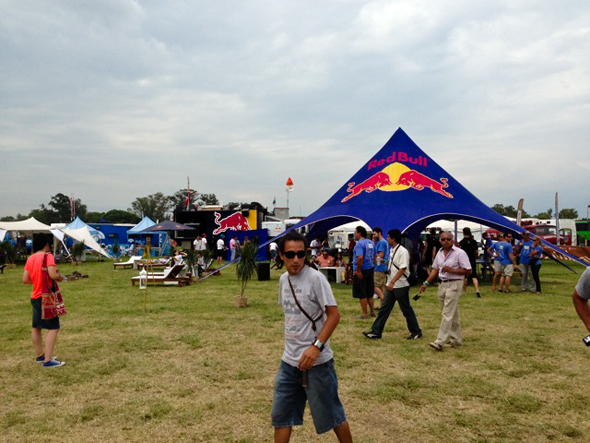 Dakar 2013: Bivouac at rest day. 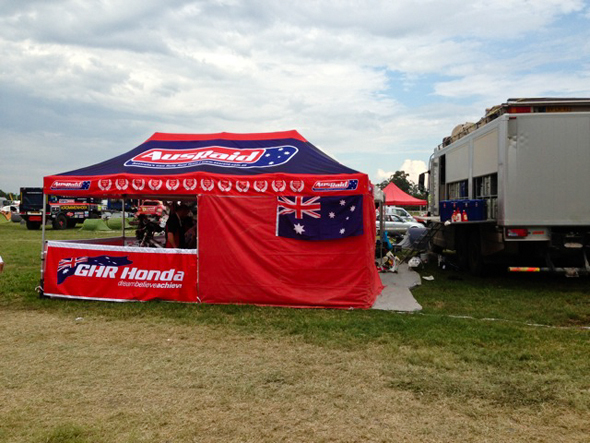 Dakar 2013: Camp GHR at the rest day. 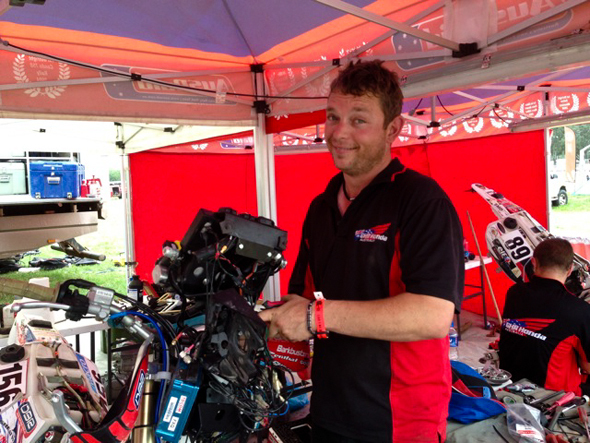 Dakar 2013: Mechanic Simon Wade with factory air-conditioning. 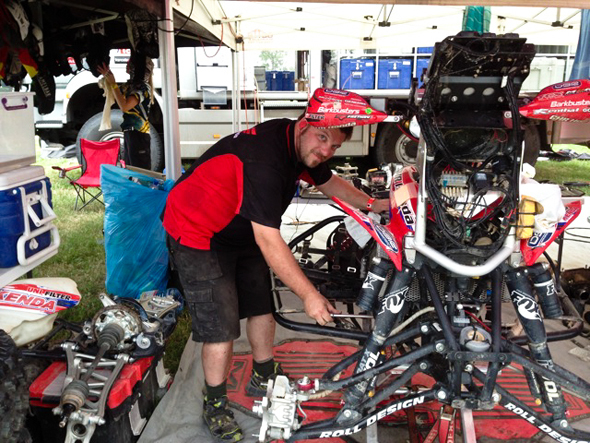 Dakar 2013: Mechanic Pete Wilhelms with Paul Smith's stage winning TRX700XX. 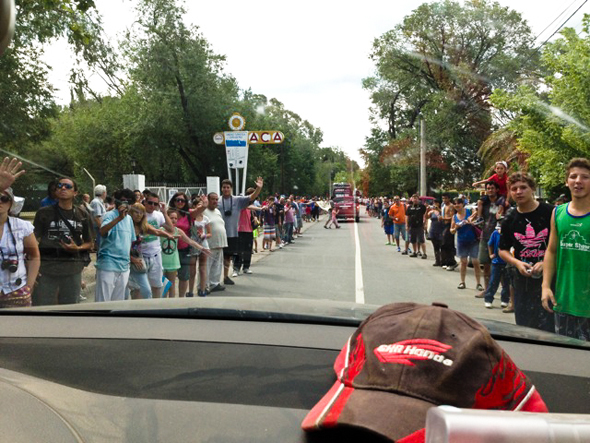 Dakar 2013: Crowds leaving Tucamán. 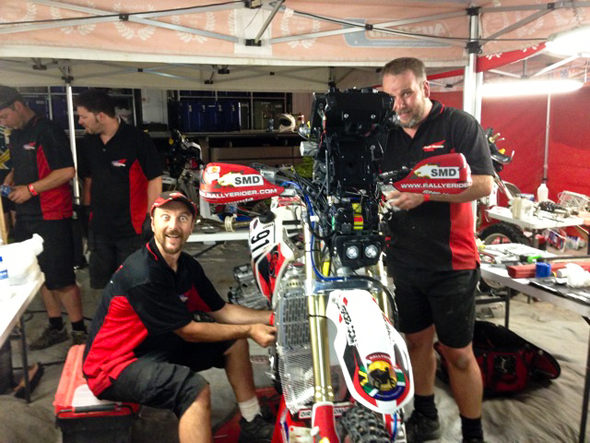 Dakar 2013: Driveway service with a smile. 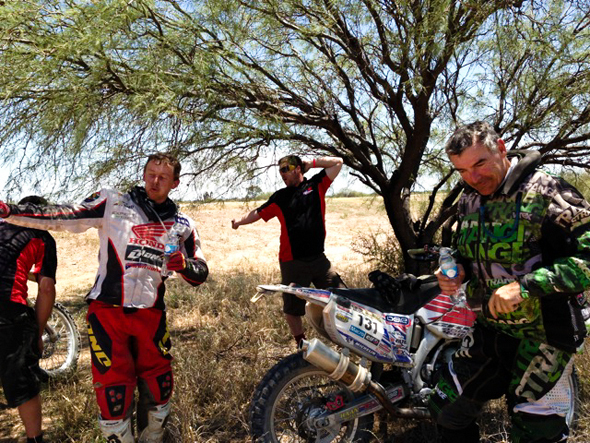 Dakar 2013: Brett and Warren hiding from the 40+ weather. 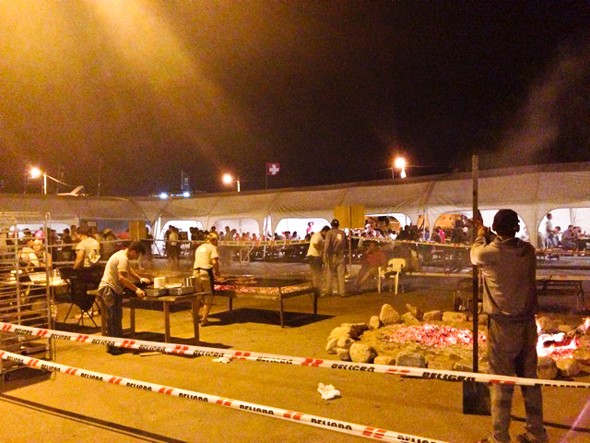 Dakar 2013: Dinner at La Rioja - chargrilled steak! 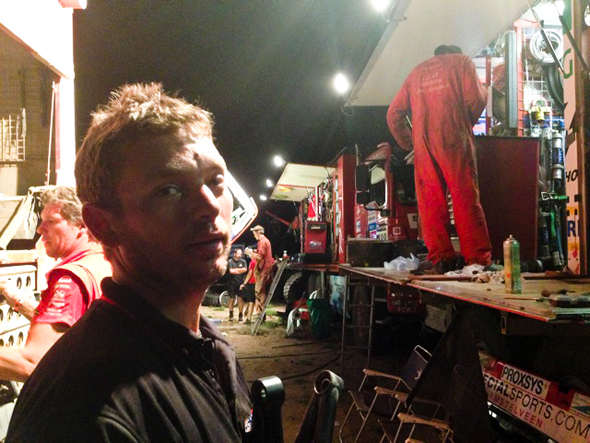 Dakar 2013: Jake Young waiting to use the MAN race team's press at 1.30 am. 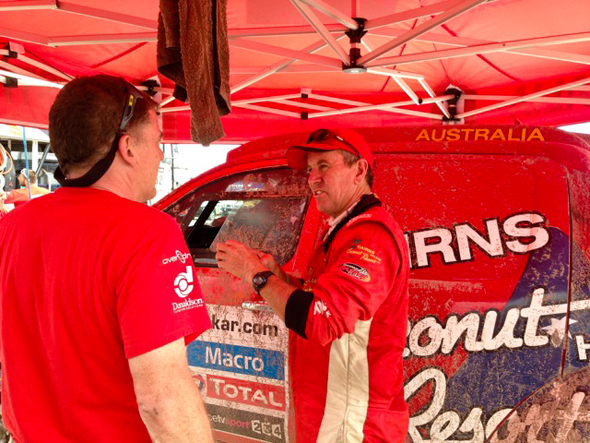 Dakar 2013: Geoff Ohlolm going well, describing the day the floods came. Dakar 2013 - bath time for the babies. Dakar 2013: Paul Smith, Brett Cummings and Glen Grundy. 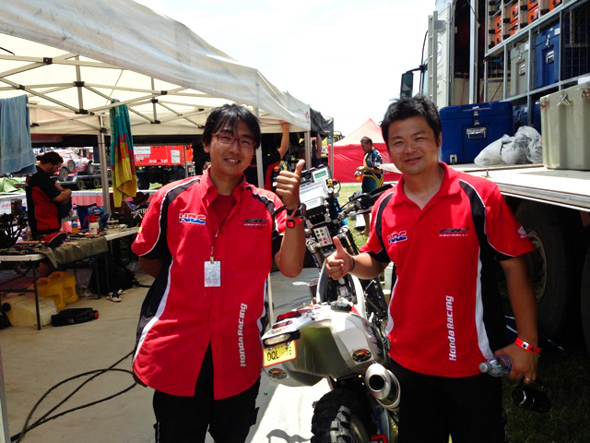 Stage 11: A first for GHR, a first for Honda, a first for Australia! 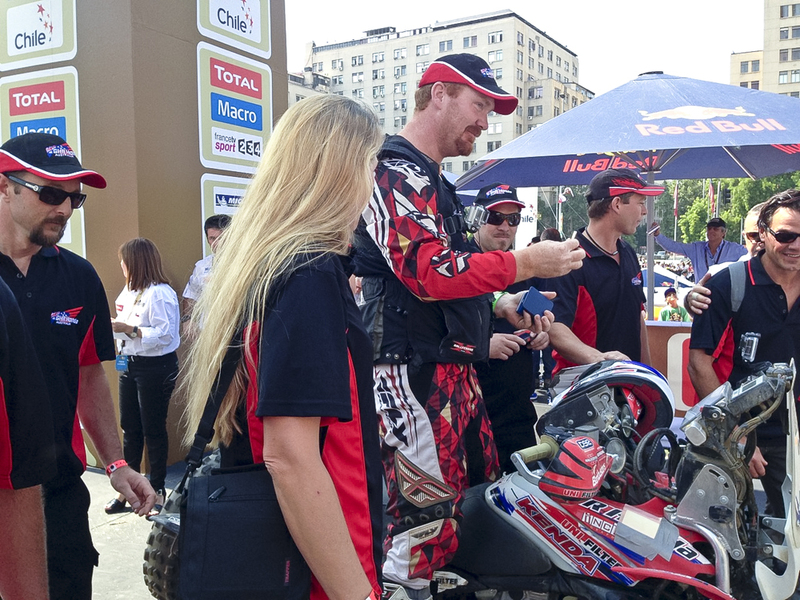 GHR Honda's #274 Paul Smith, Australia's first quad pilot at Dakar in 2013, winner of Stage 11. Picture: Mike Chmiel. 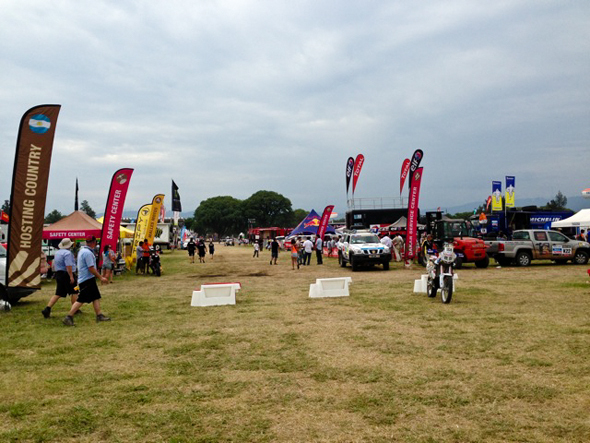 34 year old Victorian dairy farmer #274 Paul Smith had ventured into the 11th Dakar stage in trepidation. The white sands of Fiambalá have a menacing reputation amongst riders, and he was aware that many Dakar competitors have been snared by them in past years. Today his objective was just to reach the finish, but his reality was to be far more rewarding when he crossed the line in the fastest time. 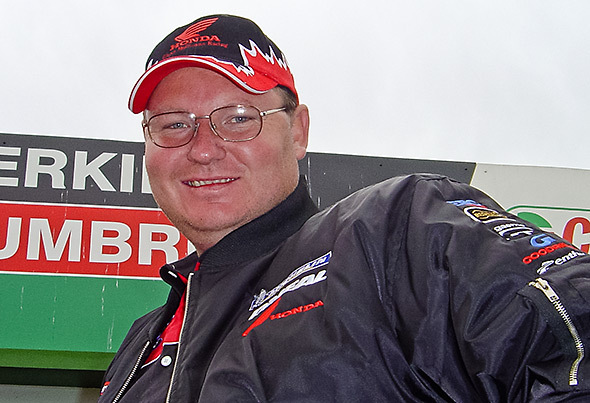 In doing so, Paul stands as the first Australian to clench a stage victory since the late Andy Caldecott, and the first Honda rider on two or four wheels to top the time sheets at this year’s event. His finish 00:04:18 ahead of Gaston Gonzalez and 00:05:42 in front of event leader Marcos Patronelli elevates Smith to 8th overall. A high speed tumble cost a small amount of time but a quick recovery and careful navigation kept him on top at all but two waypoints. The #274 TRX700XX quad was modified yesterday by team mechanics to optimise cooling along with the three CRF450Xs in the moto class. Extra thermo-electric fans were fitted, passive ventilation improved while surplus weight was removed. Consequently Smith was able to push harder than before in the soft terrain. It transpired that today was never as hot as expected. Recent precipitation suppressed dust for the riders but this also meant soft mud supplanted soft sand as the challenge de jour. However, fortune would have it that they were just spared the most significant result of the rainfall. Only a handful of cars made half way through the stage before flash flooding rolled through to render it impassable for the larger vehicles. Accordingly race organisers neutralised the stage at CP1 for their categories. Just three stages remain in the 2013 edition of Dakar, but the race still has plenty of ground to cover. Stage 12: Fiambalá > Copiapó starts at 04:15 tomorrow morning with a 392km transport over the western border of Argentina back into Chile. Peaking early at around 3,000m above sea level, 319km of highly variable terrain snakes back into the Atacama Desert for the special. The wonders of the digital age mean anyone, anywhere can be a trackside Dakar spectator of sorts. Here are some lo-fi videos from ground zero. #1 – For those watching the SBS broadcast, these two characters will seem familiar. They were the two helmetless locals astride a dirtbike chasing Nasser Al-Attiyah’s buggy, the passenger with video camera in hand. #2 – No need to speak french to appreciate this one. For all the obstacles encountered at Dakar, this simple water crossing proved too much for some. 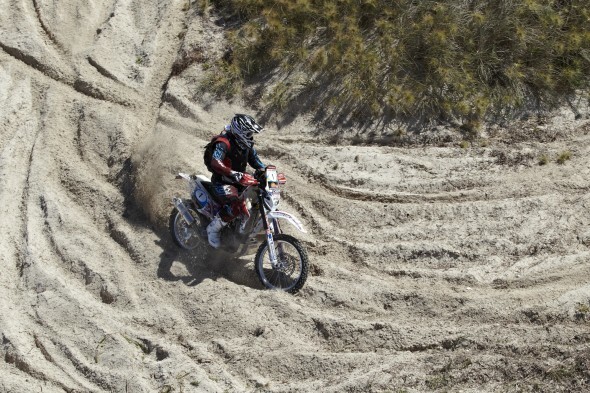 #3 – Some raw footage of the riders finishing one of the sand dune stages. Today’s stage between Córdoba and La Rioja was the last in the Argentine mountains for this year’s Dakar and the special more closely resembled an enduro or WRC stage than postcard Dakar dune country. Still, it was heavy duty exercise from the outset on the riders’ bulky, fuel laden machines. Meandering soil tracks flanked by dense scrub wore down even the fittest athletes as they negotiated blind corners at speed for near on 5 hours. River crossings offered fleeting moments of respite from the stinking heat and dust but tacked yet another hazard on to the running list of potential show stoppers in the roadbook – the prospect of drowning an engine. #156 Todd Smith was the fastest Australian on the stage today, spending most of the special in the top 20. #89 Brett Cummings stayed out of trouble finishing 30th for the day, and #131 Warren Strange was less than three minutes behind in 33rd on stage. #274 Paul Smith muscled his TRX700XX through the stage in just over 5.5 hours, safely within the top ten times throughout today. Stage 11: La Rioja > Fiambalá means a shorter distance for the riders, but all anticipate an exhausting return to sand dune country. The 256km north bound liaison will deliver the first bike to the start of the 220km special at 09:15. Race organisers estimate that the lead group should finish the stage in approximately 3.5 hours but the soft sand and inhospitable conditions will tax the rest of the field to breaking point as the day warms. To give them the best prospects of a trouble free run, the mechanics will make some bodywork modifications to boost engine cooling while all four riders are resting outside of the bivouac this evening. Tomorrow will definitely be an important factor in the final outcome for the rally.